ProgrammableWeb has been doing a fantastic job chronicling web app APIs for over three years, and today they reached a milestone, surpassing 1000 APIs tracked. ProgrammableWeb is a great resource for developers cooking up great mashups, so kudos to them. Quite fittingly, the 1000 API mark was achieved by the submission of the New York Times Community API, demonstrating that mashups are now mainstream. One of the trends we’ve seen in open APIs is that within a given market segment, once one API becomes a huge success (like Google Maps or Facebook), or a sufficient number of leaders offer APIs (like in eCommerce), that a competitive or defensive reaction occurs and soon everyone else in that sector feels like they need to offer an API. It can be a domino effect. The site also mocked up some graphs from their API database. 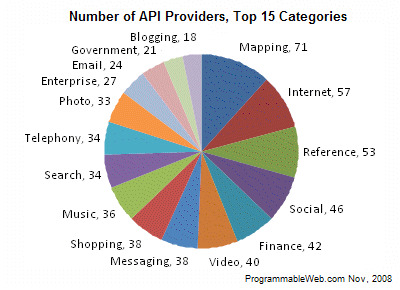 For example, here is a rundown of the top 15 sectors or markets with the greatest number of competing API providers. Mapping seems to be the most popular, while you would expect video, search, photo, social and music to score higher. The smallest number is even more telling: it’s APIs for blogging. 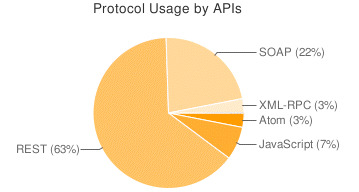 On a technology level, they also offer a nice observation: 63% of the APIs in the ProgrammableWeb directory are REST-based. We’re interested: do you use any of the APIs in their directory to enhance your application? How? What’s your favorite API, and why?